Are We Almost Ready to Go? 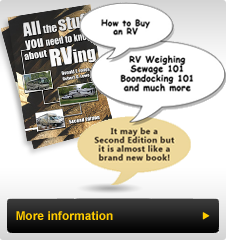 Sometimes it seems that it takes a long time to get a RV out of storage and ready for a season of RVing. From my experience, and that of many others, proper preparation before storage reduces the time required. On motorized RV’s, if all major systems were serviced prior to the Winter Storage, then there is no need to change the engine and generator oil, grease the chassis, change filters and clean interior appliances and areas. If these areas (among others) were not attended to before storage, then now is the time to do it. With a harsh winter, the need to have full strength antifreeze in the engine and generator (if not air cooled) is emphasized, since serious damage can occur from not having the proper strength coolant. If the interior fresh water system was properly prepared and winterized, there should not be any leaks requiring repairs. If there are, then these will need to be completed before the RV is used. A search of the RV for uninvited "guests” such as mice may be required. With the harsh cold, some mice may have ventured into the coach or trailer seeking protection and food. They can create quite a mess and an offensive odor! Check all storage areas and cabinets for these uninvited "guests”. I am reminded of a RV that I was helping the owner exchange his halogen bulbs for LED replacements. In an area in a slide out kitchen above the counter was a row of cabinets with four halogen "puck” lights set in the lower section over the counter. One was particularly hard to remove and ultimately we decided to remove the fixture from the cabinet. After prying it down we were flooded by dry dog food pellets falling out of the now open hole. These pellets created quite a noise and sight as they fell and bounced out on the counter. The owner had stored his coach for a couple of months in the fall before re-activating it for the trip to Florida after Christmas. He had left a full bag of dry dog food in the basement compartment under the kitchen, having forgotten to remove it. He had noticed that it had been opened by mice however he had not seen any evidence of them and assumed that they left with the food. As it turns out there is a 1-1/2 inch deep cavity between the lower kitchen cabinet bottom and the area where the lights were mounted under it. This cavity carries the electrical wiring to a switch panel on one end, the halogen light fixtures and some 120 Volt AC wiring to a plug on the lower surface. This area became the storage place for the dog food, which we surmised had been carried up, pellet by pellet, one end of the slide-out from the basement using an access raceway channel. He told me he took out over three full yogurt containers of dog food from this area. Sometimes the evidence of pest infiltration shows up in some interesting ways. If the RV has a Washer/Dryer then it is a good idea to run a cycle to check it out and also to flush the antifreeze from it. Cleaning and polishing cabinets, floors and other areas can be saved for a rainy day, so other than reloading the RV for travel you are "Ready to Go." Go RVing and enjoy your season of travel!